This statement by Jefferson is the foundation of everything we represent as a country and as a people, yet stands in dark contrast with the practice of slavery that was embraced by our Founding Fathers at the time. The ongoing conflict between the Palestinians and the Jews, that is highlighted in a Palestinian nursery rhyme, “Palestine is our country. The Jews our dogs”, and the Jewish teaching that, “Arabs are the same as animals. There is no animal worse than them”. The Nazi’s attempted extermination of the Jewish People and the horrific genocide in Rwanda in 1994. The wholesale slaughter of Native Americans across the US, and the campaign to “educate and civilize” Alaska Natives by systematically and forcibly removing Native children from their homes for “education and assimilation” in boarding schools. These are but a few examples of Humankind’s unique capacity for cruelty. 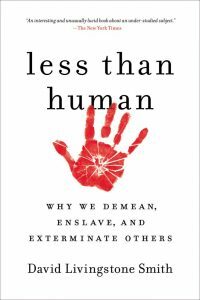 On the next Line One, founding director of The Human Nature Project and Professor of Philosophy at the University of New England, Dr. David Livingstone Smith, will join co-host Prentiss Pemberton for a discussion about dehumanization, fear, and moral disengagement.